We are all different & have different life experiences. I am so grateful our paths have crossed here. Sometimes in life it is difficult to know what path to take, which bridge to cross. Perhaps the most difficult lesson to learn is: Which bridge in life to use or which one to break off. I tried to follow the path my loved ones wished for me, the path of non disclosure. I tried with all my heart, my head was telling me this was the right thing to do, for my family & I. As much as I tried I was always doomed to failure & ended back right where I started. Only then when I was finally ready did I put all my trust in God & follow the path that my heart had spent a life time telling me to follow. It may seem like a cliche but it is true. Disclosure is a path you can never go back on. Rather like an obsessed gambler playing roulette, the stakes are high. You have no idea of the outcome, who or what you may lose & the rewards a life long dream. You also have to accept that you may lose more than you can ever imagine. I found my nature drove me relentlessly down this path, which culminated in a huge leap of faith & for me personally, the most incredible spiritual journey. Sometimes we need to walk a path that some of our loved ones, our families our friends cannot contemplate or even begin to accept. That can be the loneliest path of all. Given time they may eventually walk with you on that path, when they have given their broken heart time to heal. There is always hope. I perhaps had less to lose than many as I only have a very small family. Nearly all of my friends have accepted me. I may have been more fortunate than most in that I appear to have only lost two of my longstanding male friends who I have known since my college years. My heart still aches for the loss of my best male friend. I have no closure but I guess that is the price I have to pay. I miss our friendship so very much but its gone, from the minute I told him of the path I needed to take. He tried, he really tried but just could not come to terms with what I had done to our friendship. I have to move on & accept his decision. The change in the fundamental dynamics of our friendship was too much for him to bare. May be understandably his girlfriend also finds the path I need to tread too complicated to comprehend. Who can blame them? I have broken their trust, our friendship was based on a lie. We travelled the world together as mates but even though he said he would still be my friend, from the day I left for facial surgery our paths have never crossed again. He never returns my calls or my letters. Mine was for him a path too far, our bridge was broken. There are those who tell you their path is the only way but they are not you. These people can be really hurtful even if they are well meaning. Unless asked for they should not force their opinions on others. It is your life. We have to find our own paths. Life can on occasions be cruel & we face many challenges. This week I stumbled a little on my path. For a time I felt weighed down by self doubt & frustration, as I tried pushing myself too hard, much to the worry of my loved ones. Life is too short for negativity & giving up. If you are having a bad day or a bad week it is so uplifting to read of the courage of others, the sacrifices & challenges that they have faced. I feel blessed to have come across people who inspire & have overcome great adversity. Tomorrow is the London Marathon. A wonderful event where dreams are fulfilled & in the process a lot of kind people help raise funds for very deserving courses. Many of the runners are there after tragic life changing events. Their stories of overcoming adversity are very humbling & so inspiring. Please read the story of Phillip Packer http://www.philpacker.com/who on the 19th February 2008 was injured in Iraq and is now a paraplegic. He is determined to raise £1 million for Help for Heroes with support from others. He will attempt to walk the Flora London Marathon over two weeks from the 26th April and until then, has laid down the gauntlet to try any sport or attend any event that YOU think would help reach this target. This amazing man has such incredible determination & selfless courage. He & his comrades CHOSE a path that involves tremendous risk to serve their country. I am a wuz, a coward & I have total respect for these brave lads & lasses. They do not always receive the recognition & support they deserve, for their sacrifices. I hope the path Phillip treads is paved with Gold & raises lots of money for those heroes. My Dad used to be a very good amateur runner. He is my hero. I have asthma & have always been useless at running. I would love to be able run in the London Marathon one day but that remains an unfulfilled dream. My Dad says "never say never!" It is a source of great joy to still be able to share walks along the river with him. 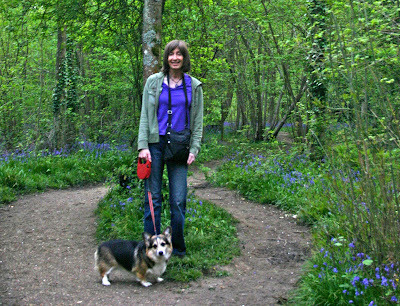 My dear Mum took this picture of our corgi & I, in the woods at a country park, not far from my home. The bluebells are now in full bloom & it is the most picturesque of settings. I never dared dream I could ever be my true self. I never dreamed we would ever have another corgi when our previous little friend Sparky passed away. He had diabetes for the last three years of his life. We had to inject him twice daily & his moods like his health went up & down until the day he died. We used to celebrate each year we manged to get him to walk to see the bluebells & even now I cry just thinking about the little love, slowly walking the path, that eventually led to doggy heaven. The bluebells are a symbol of hope & remembrance to our family. The little guy we have now has brightened our lives & feels like a gift from heaven. We are so lucky to have him. I never ever imagined I would one day find acceptance from my beloved elderly parents & be able to walk with them along a path, as nature had always intended. It would be so lovely if one day all our paths could lead to us meeting up together, as you have all from afar, so often reached out, held my hand & truly touched my heart. A few weeks ago I was kindly given this poignant quote from Walt Disney. I have always been a great fan of his films & am still very much a child at heART. "All our dreams can come true - if we have the courage to pursue them". What ever path you take in life may it be the one to happiness. PS Yesterday evening my Mum presented me with a really sweet gift, a cosmetics bag for me to take to hospital when I have my GRS surgery later this year. I am so lucky to have her unconditional love & this was a very special moment I will always treasure. My Dads day was not so good. His heart sank yesterday when our football team got relegated again & may now go out of business. On Saturdays even at the age of 84, listening to the game on the radio he still kicks every ball. He encouraged me to join him 35 years ago on the path to his great passion & I loved bonding with him on that journey. Last night he was taken poorly at a group of friends & did not feel at all well describing the symptoms as "I felt like I was somewhere else". This morning he is still not feeling his usual self. I hope & pray he will be ok. The path this week has been a very emotional one to climb but I will keep pushing on. Bluebells! There is something very special about them, it's a lovely picture, please thank you mum for taking it. It's up to all of us to make the most of our lives and all of the challenges life throws at us. I hope we all meet up one day too. Debbie, I don't think you realise the power of your own thoughts. You mention the courage of others. Yours truly is a story of courage and maybe you don't see it. I take great heart and spirit from your words and your kind thoughts for others. Please pass along a hug to your Dad from me? I hope he's feeling better soon! I love the photo! Thank your Mom for me? I'm glad you found your path and the courage to follow it. That others have chosen a different one for now doesn't mean theirs won't rejoin yours somewhere along the way! There is also the sad possibility that if it doesn't, you were better off without them, though I know that one hurts as I've been there far too often! My path has been quite rocky this week & I am not too sure where it will take me next. My Dad thankfully seems to be feeling a bit better now & this evening we had another magical trip to see the bluebells to round off quite a week. Always enjoy the bluebells at this time. You are right there are more than one path and its important to follow the one your heart advises not the one others point to despite the thorns you've got to clear along the way. I am sure the disappointment over this seasons relegation will be replaced by optimism over the next like most fans and be consoled that its been a long long time since a league club went out of business.